Nine birders (Hans, Lorna, Marian, Eleanor, Mike, Terry, returnee Annie K, newbie Gareth and me) spent a glorious Monday morning along the causeways to and at the two Tsawwassen Ports, Ferry and Coal/Cargo. The tide was high and the hi-lites were the thousands of waterfowl in the Bay (actually the Georgia Strait), topped off with a scrumptious Smoko of Annie’s fresh veggies, Eleanor’s cookies and our staple, Lorna’s PB sandwich. 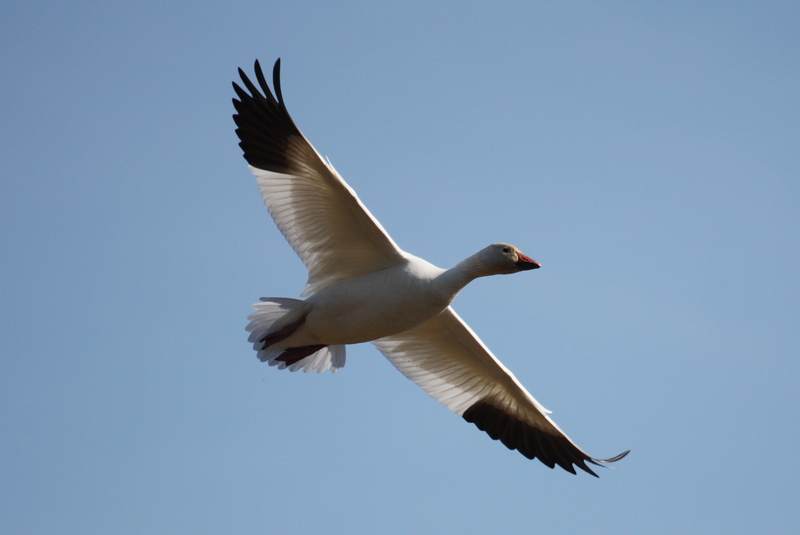 Check out Terry’s photos (soon) on our DNCB Picasa site at http://picasaweb.google.com/dncbirding. 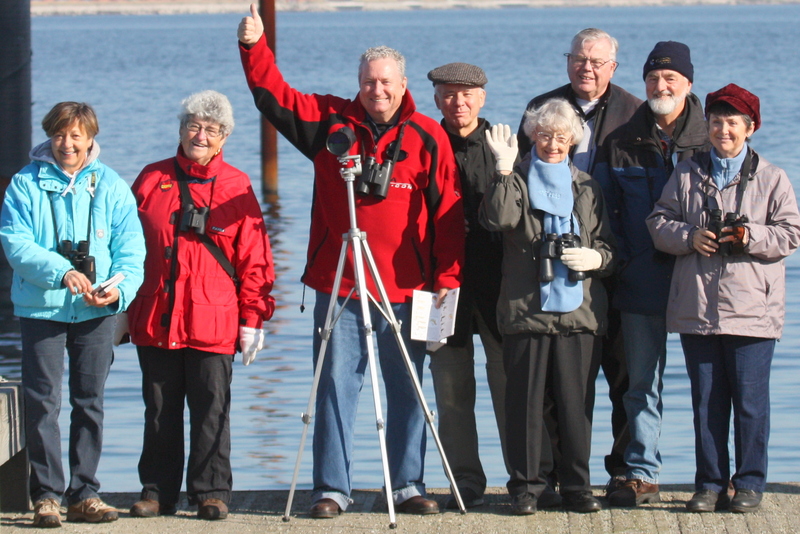 First stop was at the “birders pull-off” on the causeway just before the entrance to the Tsawwassen Ferry Port. 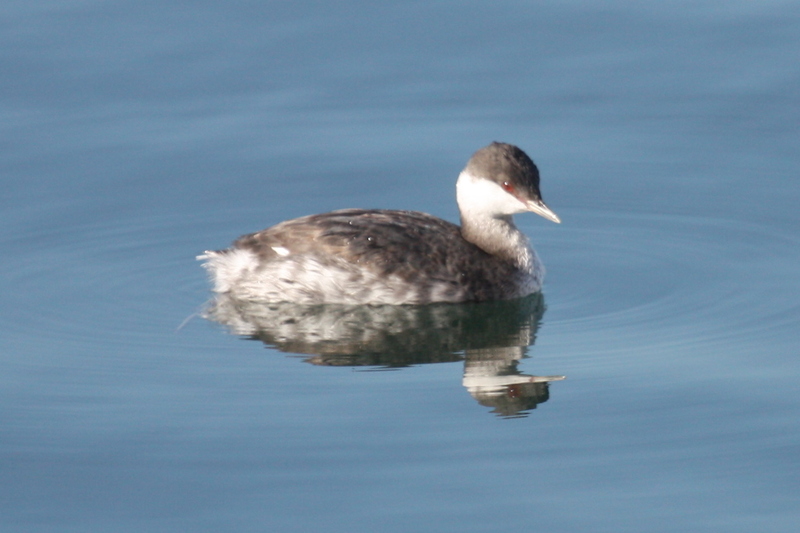 Hundreds of Horned Grebe were diving close to us while the spit was covered with Northern Pintail, American Wigeon, Double-crested Cormorants, Mew and Ring-billed Gulls among the Glaucous-winged, and interestingly, only two Mallards. 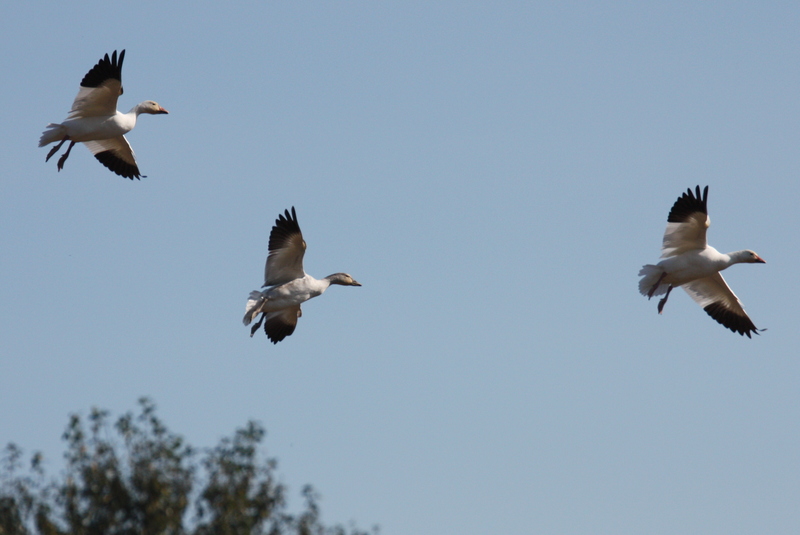 The ducks were briefly spooked as a Peregrine Falcon gave us a neat fly-past. 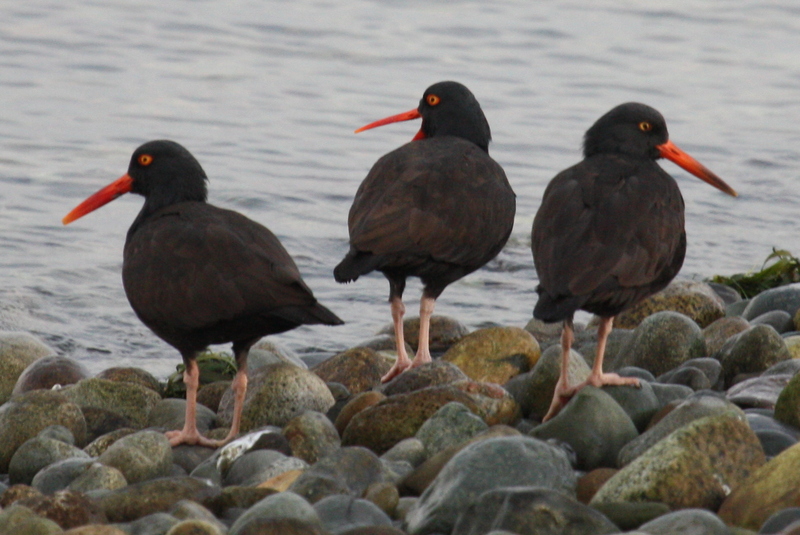 A bit further back along the shore, we watched 11 Black Oystercatchers foraging under rocks. 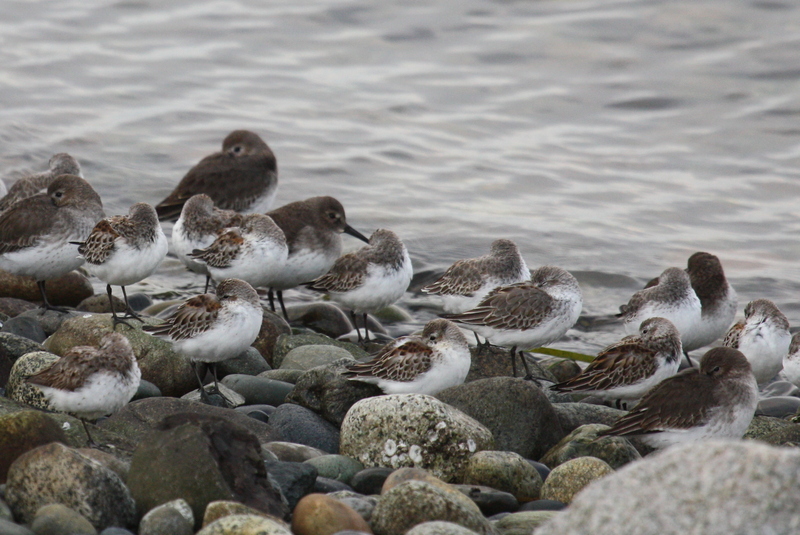 Next to them was a huddled flock of Western Sandpipers with about a dozen Dunlin surrounding them. The sun was behind us and we got great views, up-close-and personal, especially as the flock (~100) swooped in front of us several times. 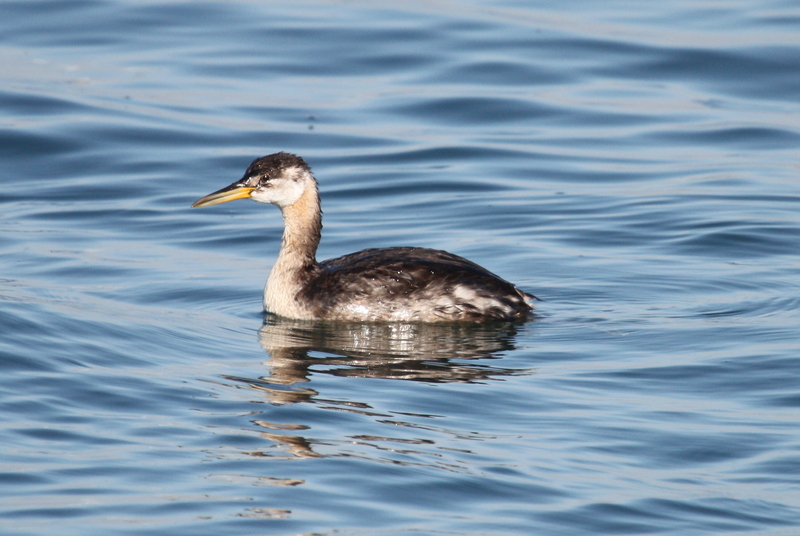 Common Loons, White-winged and Surf Scoters, and Scaup species were among the thousands of ducks in the Bay/Strait. We moved on into the Ferry Port where the Black Turnstones are regularly seen. Several roosting there as an inquisitive Harbour Seal eyed us closely. 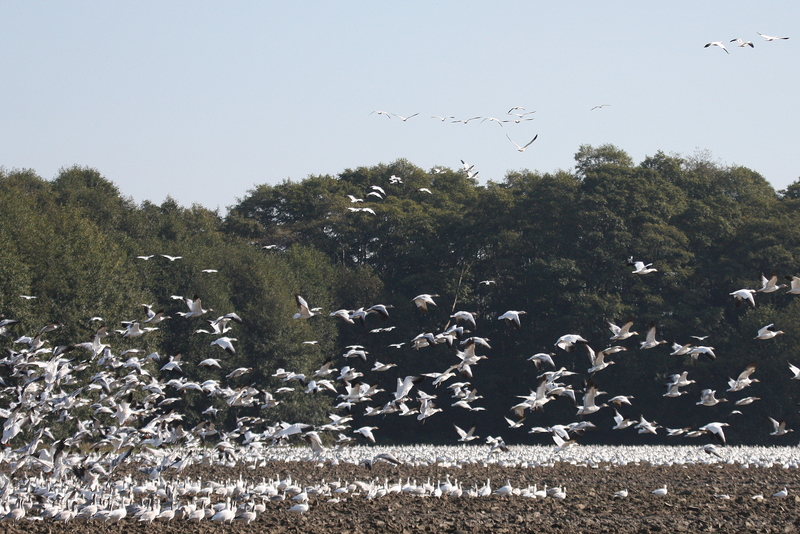 On the way out, we checked quickly for the resident Harlequins and Willet, but didn’t see them. Not much seen through the Tsawwassen First Nations reserve, other than some White-crowned and a Song Sparrow that almost looked like a White-throated Sparrow. Entering the DeltaPort causeway, I noticed that the rail cars were not blocking the way to the Brunswick side of the Port. We stopped, crossed the tracks, and saw a raft of thousands of ducks huddled in a streak a couple hundred metres from shore. Mostly Green-winged Teal were close in. 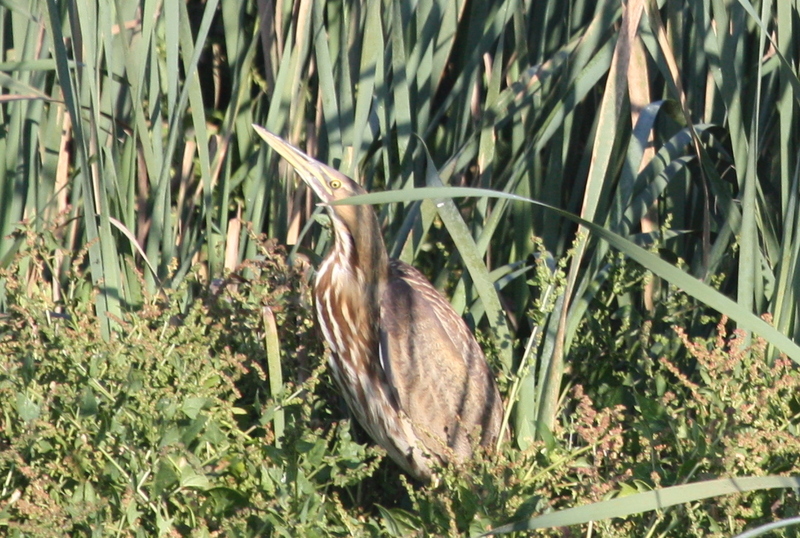 As we were watching a flock (6) of White-fronted Geese fly over us, Lorna spotted an American Bittern in the reeds. It posed for us, just long enough until the Security folk asked us to leave. We looked unsuccessfully for a No Entry sign to pose under for our obligatory Group Photo. We continued into the new cargo portion of DeltaPort where we could look back with the sun behind us. I guess Hans’ good lucks befuddled the Security Guards as they allowed us to venture down onto the dock close to the water. A Glaucous-winged Gull was feeding on a large floating Chinook(?) Salmon carcass. 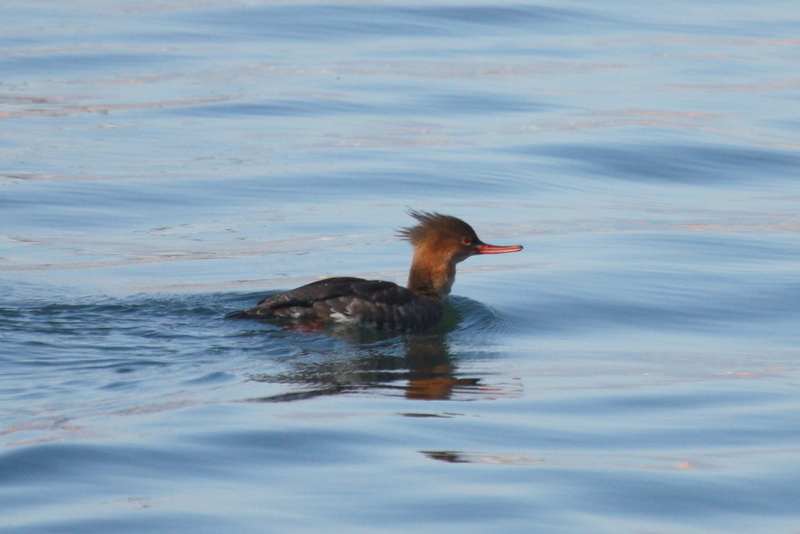 We had excellent views of Red-breasted Mergansers, Lesser/Greater (?) Scaup, and Red-necked Grebe next to Horned. We enjoyed our delicious Smoko there in the sun, before I left for a Cammidge House Committee lunch. Some of the group continued on to Alaksen where Gareth dropped off a dead bird for examination by CWS. 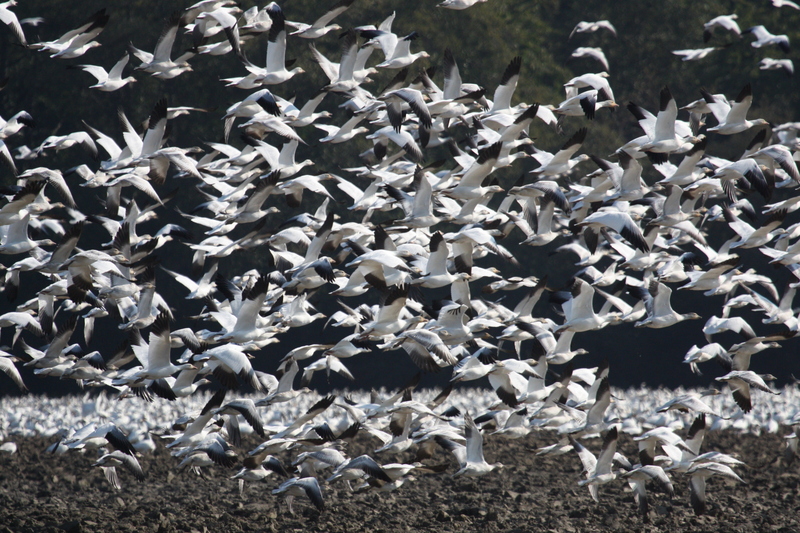 A large flock of Snow Geese was in the field by the Alaksen entrance. I will be at Petra’s next Monday morning, October 23 for departure at 8:00 a.m. on an outing, probably to Point Roberts, USA. Bring your Passport. Comments welcome, check out our DNCB Blog at https://dncb.wordpress.com/, and please advise if you want off this list. This entry was posted in *DNCB, Alaksen NWA, DeltaPort Causeway, TFN, Tsawwassen Ferry Port. Bookmark the permalink.